Laser Interferometer Space Antenna (LISA) is a project to detect and measure gravitational waves. The project has three spacecraft flying in a formation of near equilateral triangle in a heliocentric orbit trailing Earth. Many sources of perturbations cause the configuration to deviate from the nominal. 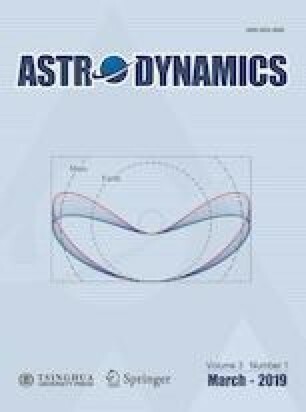 This paper studies the formation design problem for a LISA-like mission by considering ephemeris-based dynamics. This type of mission is well-known for addressing several strict mission requirements under the realistic dynamics. The problem is formulated as optimizing multiple mission performance indices. It is observed that some indices are correlated with each other, whereas some indices have different sensitivities with respect to the semi-major axis. Therefore, the problem is transformed into a two-step cascade single-objective optimization, in which the optimal solution of the first optimization problem is fed to the second optimization as initial value. In addition, the major perturbing celestial bodies are picked up to make a simplified but accurate enough dynamics to speed up the optimization. Numerical examples verify the analysis and show the effectiveness of the optimization procedure. The influences of mission lifetime and spatial scales on the optimal solutions are also presented. Chihang Yang is currently a Ph.D. student in Technology and Engineering Center for Space Utilization, Chinese Academy of Sciences. He received his B.S. degree in automation from Beijing Jiaotong University, China. His current research interests include dynamics, control and application of spacecraft relative motion, especially spacecraft formation flight and large-scale spacecraft swarms. Hao Zhang received the B.S. and Ph.D. degrees in aerospace engineering from Beihang University, China, in 2006 and 2012, respectively. From 2012 to 2017, he was with the Asher Space Research Institute, Technion - Israel Institute of Technology, where he was a postdoctoral fellow. He is currently an associate research fellow with the Technology and Engineering Center for Space Utilization, Chinese Academy of Sciences, China. His research interests include distributed space systems, astrodynamics, and GN&C. The work was supported by the Hundred Talents Program of the Chinese Academy of Sciences and Strategic Priority Program A (Grant No. XDA15014902).